During the 7th Cologne Academy on Business Negotiation and Mediation a group of students and practitioners examined a fictional but realistic case, regarding a dispute between two parties. Throughout the workshops of the academy the parties tried to solve their conflict by negotiations and by mediation, before it was finally decided via arbitration. The lectures given during the Academy were completed by scripted video clips, which gave a general impression of negotiation and mediation in real life. On Monday morning Professor Ian Macduff introduced the participants into negotiation techniques. Firstly, to get a better understanding of the situation of the quarrelling parties, we dealt with conflict escalation mechanisms. Then we concentrated on the art of conducting a negotiation. In this regard, we discussed the various qualities of a good negotiator and factors that might influence the parties as well as the negotiation process itself. On Tuesday Professor Ian Macduff showed us how a third party can change the dynamics of a negotiation, as we were inducted into mediation. Based on the knowledge gained the day before, we compared the role of a negotiator to the function of a mediator. The lectures of Professor Ian Macduff, versed in the field of mediation, were shaped by his own experiences and, therefore, drawn from life. Alongside the lectures, role-plays enabled us to implement our newly acquired theoretical knowledge in a practical way. On Wednesday the workshop was hold by Christopher Newmark, who gave us an insight view into his role as a mediator in London. He provided a lot of valuable information about the specifics of commercial mediation and about encouraging the parties to reach a settlement. In addition, he indicated how lawyers should support their clients during a mediation. On Thursday Professor Klaus Peter Berger focused on the last stage of mediation: phrasing the settlement agreement. Special attention was paid to common mistakes made during this period. Afterwards, the academy ended with a joint session, in which Professor Klaus Peter Berger not only displayed the differences between negotiation, mediation and arbitration, but also pointed out the advantages and disadvantages of the named methods. Apart from gaining experiences concerning alternative dispute resolutions, the academy offers the possibility to meet fascinating people from all over the world. 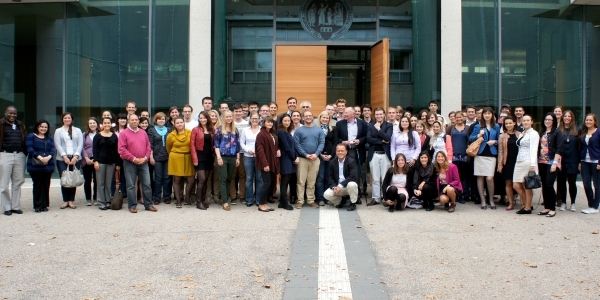 In this year practitioners and students from twenty-five countries attended the Cologne Academies. Therefore, another important part of the Academy is the diversified evening programme. It gives you the opportunity to get to know each other in a comfortable atmosphere and in an informal way. Visiting a brew house and the famous boat trip on the Rhine are just two examples of the evening programme. In conclusion, the Cologne Academy on Business Negotiation and Mediation is a memorable highlight you would regret to miss.